Whilst every effort has been made to find exact build details for 8309, it is probable that it was built between 1901 and 1902 by the Great Southern and Western Railway in their works at Inchicore, Dublin. This wagon would have worked all over the system initially on the GS&WR region, then Great Southern Railways and finally CIÉ. Ballast wagons would have had a very hard life having been subjected to the loading of stone at the likes of Lisduff, then hauled for miles fully laden prior to being unloaded into the 5 foot. 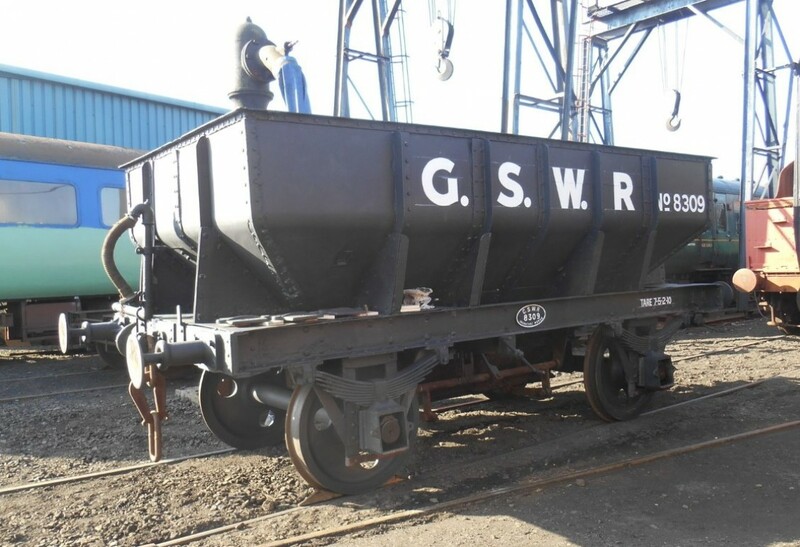 As a result of its hard life, there is evidence to suggest that the wagon was subject to a major rebuild by CIÉ in the mid 1950s having received new springs, wheels, axles and possibly axleboxes as well, though the original bearings are still stamped GS&WR. The livery selected is one of 3 variations of GS&WR wagon livery and aims to be a close copy of a scale model convertible goods wagon built by H.J.A. Beaumont, the Chief Draughtsman of the GSR and former employee of the GS&WR in the early twentieth century. 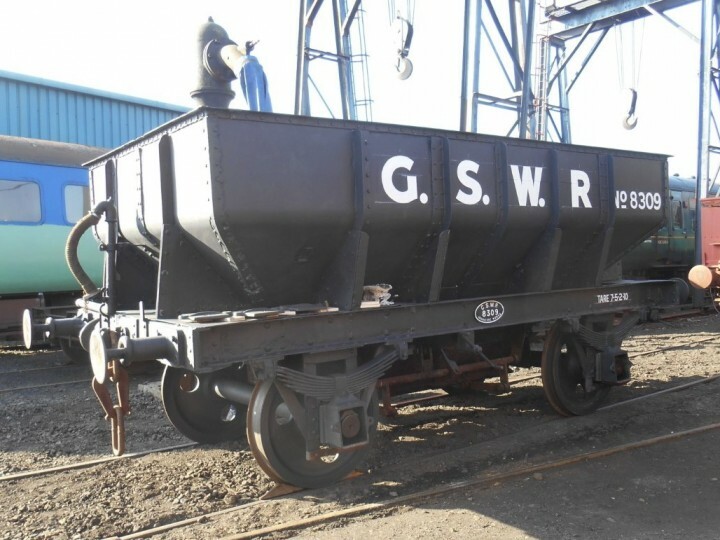 In this case the wagon was painted a very dark grey with the letters GSWR in white with the raised letters and edge of the works plate picked out in white. 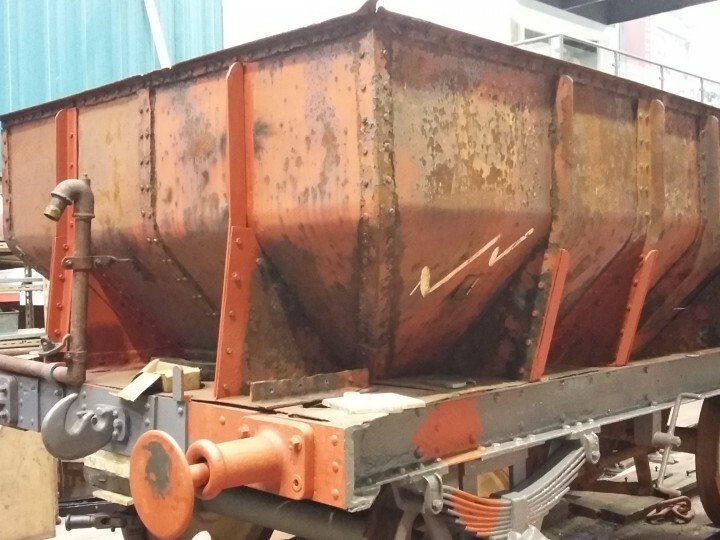 Thanks to a grant from the Northern Ireland Museum Council, the former ballast wagon has been restored for display in the new Whitehead Railway Museum. 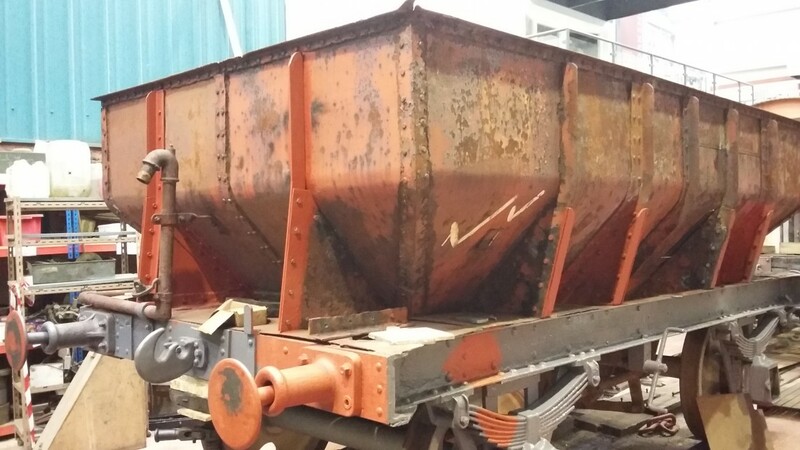 Overhaul entailed removal of years of accumulated rubbish and corrosion from the hopper, freeing up the long since seized dropping mechanism, the shot-blasting of the frame and hopper, fitting of its original bearings and re-painting into original livery for display. Over the Christmas period 2017/18, during the busy Santa season, things started to progress rapidly with 8309 in a bid to have it ready for the spring of 2018. All metal work and running gear overhaul work was complete by mid January and the wagon received its first top coat in late January. In early February 2018, professional signwriters from AirForceOne Artwork were engaged to finish the lettering on the wagon, and a week later 8309 was shunted into the gallery for display to the public.